Authors: (1) Wallner et al. / (2) Breitschwerdt et al. The Solar neighbourhood is not a quiet and lonely place. Instead, a cosmic orchestra of perpetual (think cosmic timescales) supernova explosions is taking place and infecting space with their ejecta. Evidence of this can be seen locally on Earth by inspecting the abundances of iron-60, a radioactive isotope of iron with a half-life time of ~2.6 million years, in the deep-sea crust of the ocean, which was done by Wallner and co-workers in a recent publication. The global distribution of iron-60 coming from space might be a source of error here, as its is mainly injected via large dust grains. Read more about how to derive directional information of these grains from their interaction with the atmosphere in a bite on Monday! 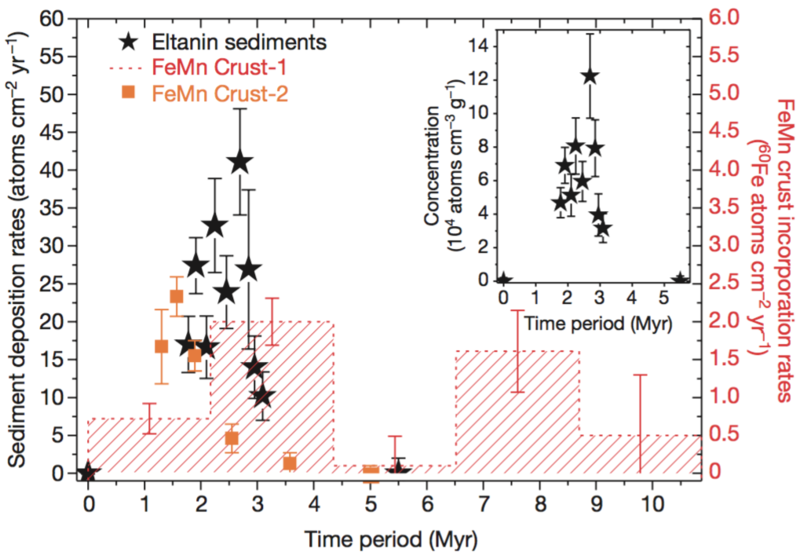 The researchers of study (1) analysed the deposition in time of this very short-lived isotope (in comparison with isotopes which live for billions of years like some Uranium nuclides) and found that inbetween 1.5–3.2 million years and 6.5–8.7 million years ago iron-60 concentration rapidly increased. As this isotope has to come from the explosion(s) of massive stars (in a so-called core-collapse supernova) the increase in the abundance of it in the sea floor tells us that there had to be a close-by supernova at that time. Their measurements are shown in Figure 1. From these measurements we can directly link to what is already known from astrophysics. The Earth (and the Solar System) are embedded in a diffuse medium, which is called the ‘Local Bubble’. When supernovae explode they eject their outer shells into the surrounding and ‘pollute’ it with heavier elements. 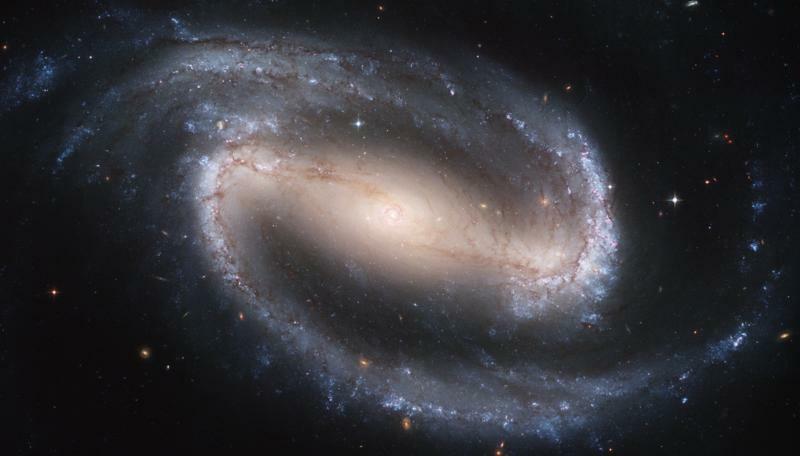 These ejecta are usually quite fast; they can travel ~100 parsec (~300 light years) in several 100,000 years and can therefore reach far-away locations in space which are not directly connected to their immediate surrounding. By analysing the spectrum of the interstellar medium (the gas and dust which lurks around seemingly everywhere) astronomers found that there is a huge bubble of material which was once ejected from several supernovae. 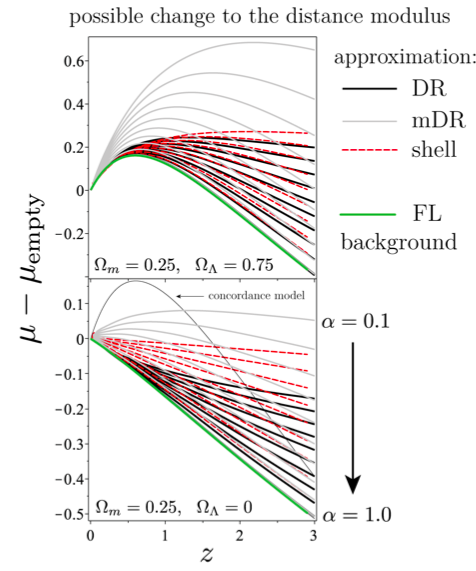 You can imagine the dimensions from Figure 2. But we don’t need to stop there. Using analytical calculations and computer simulations Breitschwerdt and colleagues (study 2) tried to relate the origin of the supernovae to stars which are now located in the Scorpius-Centaurus association (this apod gives you an orientation in our local neighbourhood). 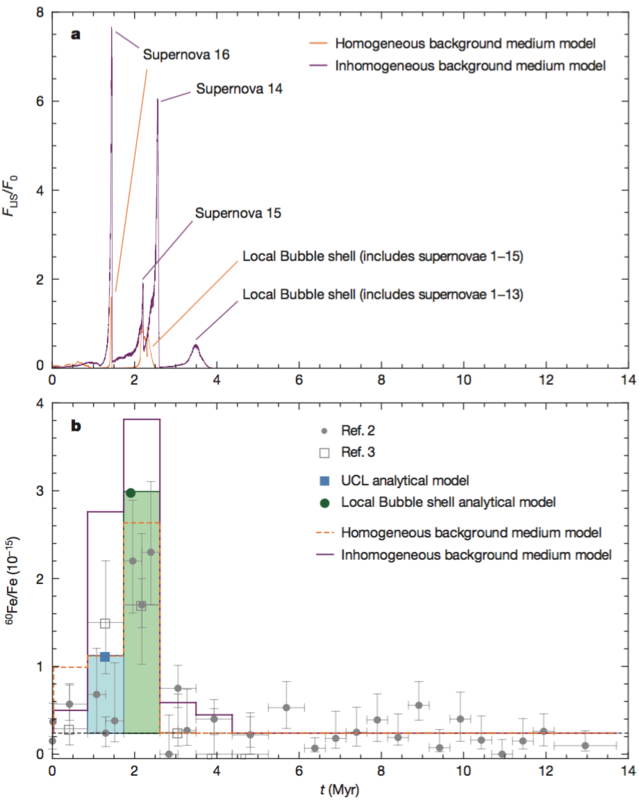 They tried to model the explosions and the likely pathways of the ejecta fronts and fitted the actual abundances on the sea floor to distinct supernovae (Figure 3). 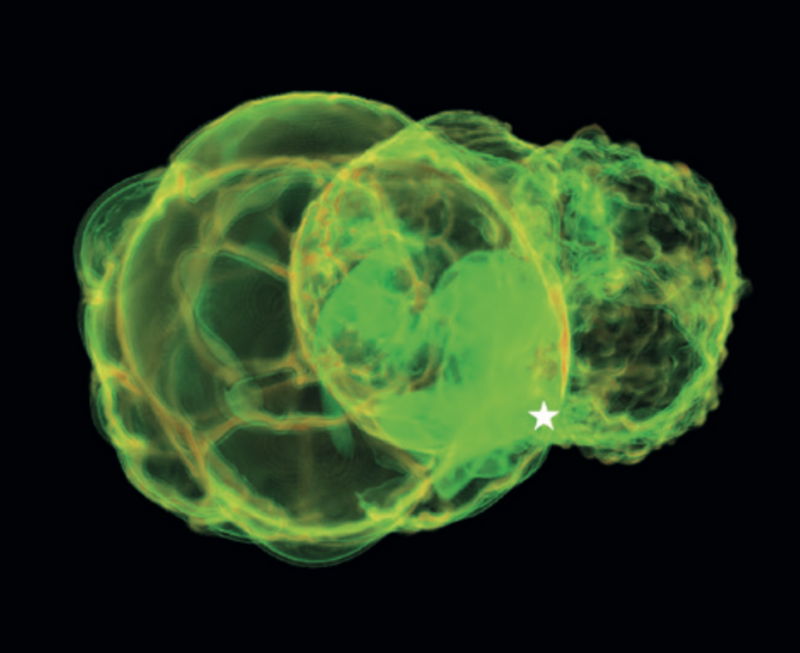 The findings fit best to the detonations of two supernovae, which are called “SN 14” and “SN 15”. The overlapping explosion ejecta reach Earth together with the relicts of older explosions and form the local bubble. Different density shock fronts in the bubble transport the iron-60 to Earth via dust grains which are layered to the sea floor. Did the supernovae affect our ancestors? 2 million years is not a huge amount in evolutionary and geological timescales. Therefore, you could speculate that such a devastating event in our close proximity affected the Earth and its biosphere in one or the other way. The explosion was definitely very bright in the sky and increased the flux of cosmic rays on Earth significantly. Luckily it was probably not in the ‘kill distance’ of ~8 parsecs, which would have wiped out life on Earth in a mass-extinction event – otherwise I would probably not type in these words. On the other hand, at roughly that time geologists measure a global decrease in temperature, which initiated the last ice age (called the ‘Pleistocene epoch’) and the cosmic ray flux was potentially high enough to do weird things to our climate. Could these supernova have influenced biological evolution and therefore human evolution by affecting global temperatures? Because of huge errors in these extrapolations this is pretty speculative to date, but with refined measurements we could disentangle lots of enigmatic connections like this. I am a post-doctoral fellow at the Atmospheric, Oceanic and Planetary Physics Department of the University of Oxford, researching how terrestrial worlds form and evolve. Please find more information on http://timlichtenberg.net. Are supernovae really so super? 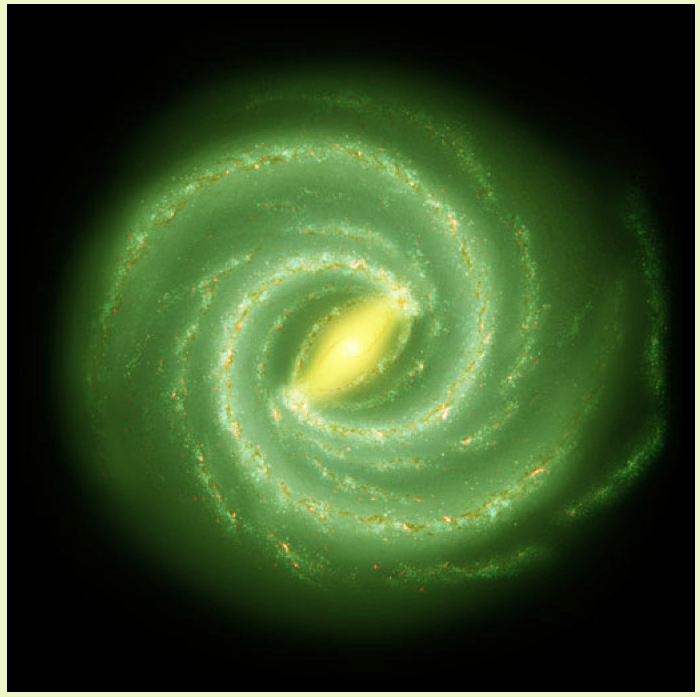 Inhomogeneities and the accuracy of distance measurements The Top 12 of 2012 Going Green… On a Galactic Scale! Bars Rejuvenating Bulges?